So why do we allow some of our favorite scientists, authors, and athletes the grace of failure, but not allow ourselves the same? We are told that failure is not an option, when in fact, it is a critical element of great success. Our wins are often all that the rest of the world sees. When we look at the people we admire, we see their successes, not all of the failure it took to get them to where they are. Albert Einstein said that failure is merely success in progress. If you don’t take a chance and miss every once in a while, it is unlikely that you’ll ever see success either. If you don’t fail from time to time, you’re not aiming high enough. There are people in this world who rarely see failure. They collect a decent salary, they have a nice home, maybe they even go on vacation regularly and enjoy meals at nice restaurants. They seem to be content with things just the way they are. On the surface, this looks pretty great! When we look a bit closer, we may start to wonder what it is that is really driving them. Are they happy just maintaining status quo? Maybe. Would they be happier if they overcame a challenge or met a big goal? Probably. We don’t always make the team or hit our home improvement goals. Maybe you have secretly always wanted to run a 10k, or receive a prestigious award. What is stopping you? The thought of failure? What’s the worst that could happen? Maybe you don’t finish the race, but because of your training, you’re eating healthier and your blood pressure has gone down. Just because you didn’t hit that finish line on time, did you really fail? It’s much easier to only take on challenges that we know we will complete successfully, but remember, the reward often matches the level of risk involved. Sure, you’re a rockstar at work, but what if you took a chance and went for a big promotion? Best case, you get the position and rock it even more! Worst case, you’ve likely had a great learning experience and gotten yourself in front of some important people in the office. Next time a great opportunity comes up, you’ll likely be on the short list of candidates. Taking calculated risks shows confidence and helps you stand out from the crowd. The only true failure is quitting. The bottom line is, success isn’t going to fall into your lap. You need to go after it. The most successful wins are not going to be without risk of failure. 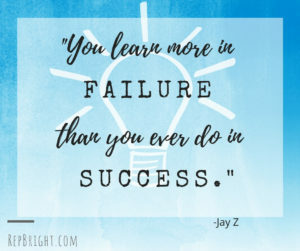 Often, we learn more from our failures than successes. We need to fail to succeed. The key is taking calculated risks and maintaining our reputation in failure. If you have a dream or a goal, keep going until you see it through. You may fall ten times, but as long as you get up eleven times, your story isn’t over.